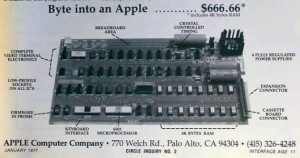 Steve Wozniak completes the basic design for the circuit board of a (relatively) easy-to-use personal computer. The next day he shows it to the Homebrew Computer Club, which Steve Jobs attends. Jobs realizes the potential and convinces Wozniak not to give away the schematics but instead produce printed circuit boards to sell. The two Steves form a company, which they name Apple, and Wozniak’s design becomes the basis of the Apple I computer. The rest, as they say, is history.